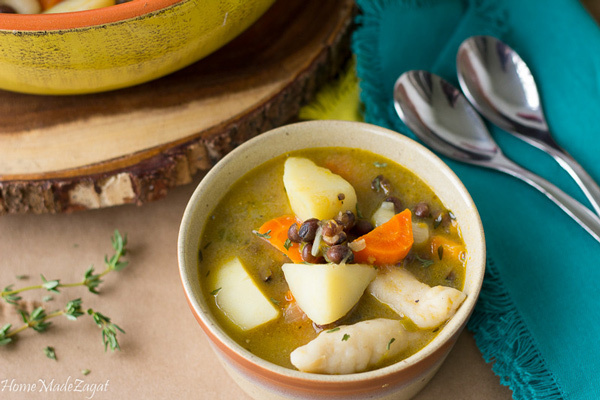 A hearty and flavorful soup filled with pigeon peas just like granny used to make it. There are some soups that just makes you smile when you put that first spoon in your mouth. Each spoon filled with a deep, flavorful broth, and topped with dumplings, meat (optional) and a host of ground provision. And this pigeon peas soup does not miss that mark. 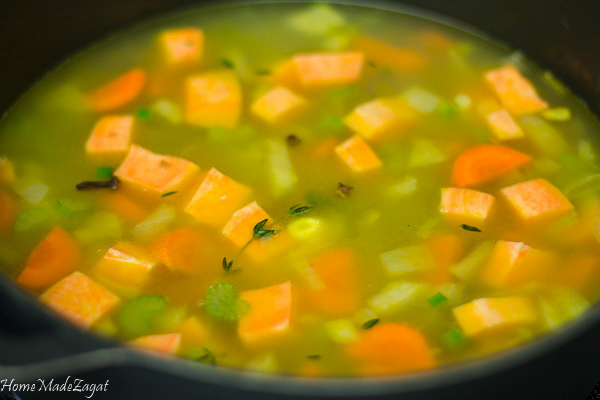 Everything you want in a soup whether it's cold winter or not. I've mentioned before that in my house growing up it was "Soup Saturday". EVERY Saturday. My Dad would head out early to the market and pick up stuff and come back and the process of "soup making" would start. 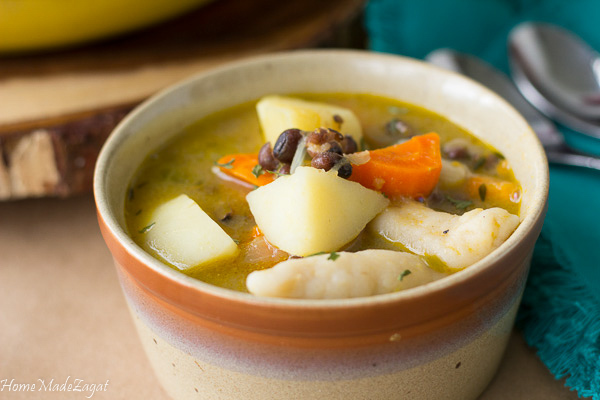 Trini's just love soup I guess, there's Saturday soup (kinda like everything but the kitchen sink kinda thing), corn soup, pigeon peas soup, callaloo soup, split pea soup, carrot soup, fish soup. I think once it's edible, we gonna "soup" it. "Stuff" include what West Indians call "ground provision". These are just what generally call vegetables that grow encased in the ground and have to be dug up to be eaten. This includes sweet potatoes (aka yams in some US grocery stores), cassava (yuca). We also call plantains and breadfruits ground provision even though they are not grown in the ground. 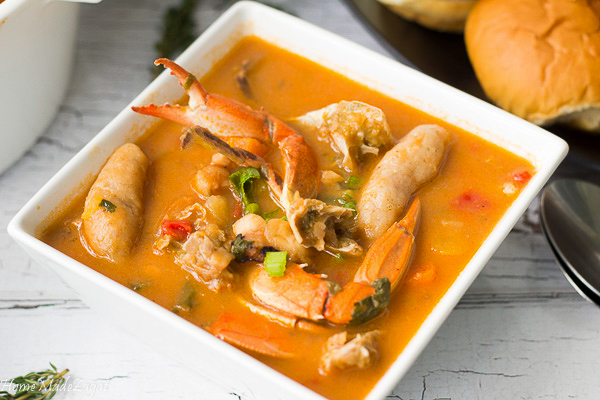 Ground provisions are a very big part of a Caribbean meal. They are incorporated into dishes, used to make their own dishes or just served alongside meats. Yes, just some stewed chicken and a host of boiled ground provisions. In this soup ground provision makes up half of the dish. You can use any ground provision you like. I am not a big fan of green banana so there is none in there. I had sweet potato, plantain, Irish (Idaho) potato on hand and they worked perfectly. But my most favorite part of any soup is the dumplings. 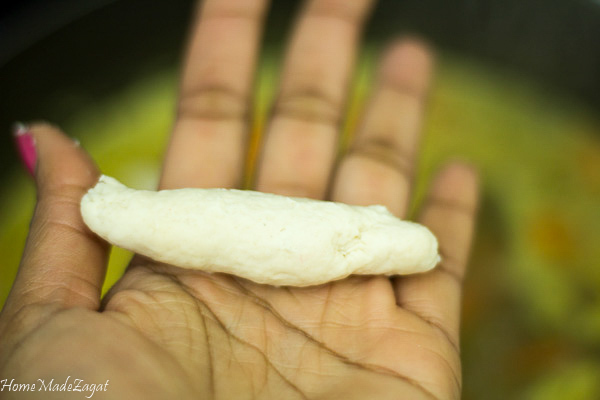 Plain old flour dumplings. roughly rolled and soaking in some of that flavorful broth!! Yummy!! 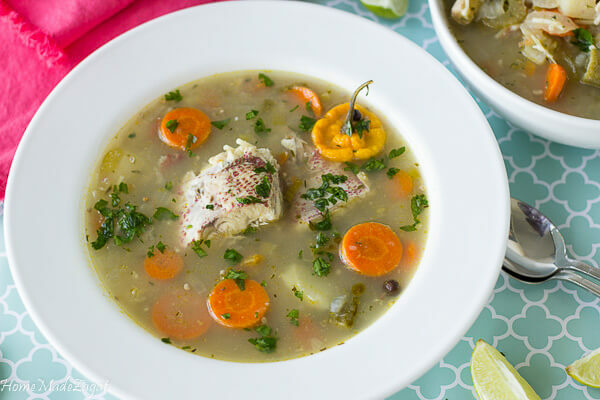 All these flavors just really create a great soup that works perfectly on a cold day or even great on a hot day. Pigeon peas are one of those type of those peas that I think is just naturally sweet in flavor. So it makes this dish so sweet that you would probably have to go through a few bowls of this yourself. And please, DO NOT forget those dumplings. Ever!!! What is your favorite soup? I honestly think pigeon peas is my winner. Let me know in the comments. 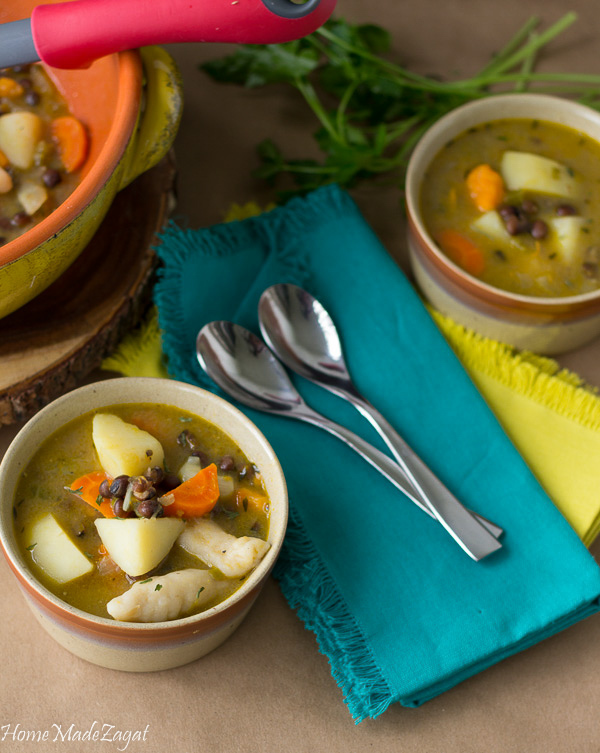 A deliciously, hearty Caribbean soup filled with pigeon peas and various ground provisions.